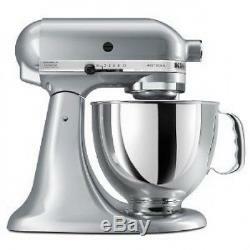 325-watt mixer with 10 speeds; 5-quart stainless steel bowl. Tilt-back head for easy access to mixture. Includes flat beater, dough hook, and wire whip; pouring shield not included. Measures 14 by 8-2/3 inches by 14 inches. Included accessories: Flat beater, dough hook, wire whip, and power hub. ATTENTION ALL CUSTOMERS: ALL ELECTRONIC ITEMS ARE 110V. 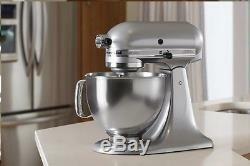 The item "KitchenAid Stand Mixer tilt 5-Quart rk150cs cocoa Silver Artisan" is in sale since Friday, January 18, 2013. This item is in the category "Home & Garden\Kitchen, Dining & Bar\Small Kitchen Appliances\Countertop Mixers". The seller is "usa-world-sales" and is located in Los Angeles, California. This item can be shipped to United States.